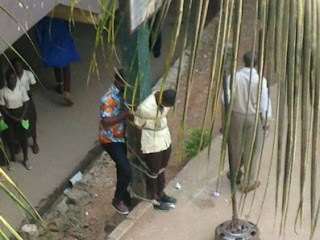 Photos of a secondary school student reportedly tied to a pillar as punishment by his teachers that just surfaced online and fast going viral has sparked outrage on social media. According to online report, in order to punish the student, a teacher used rope to tie him to a pillar in front of the school while other students watched. The students was said to have been tied to the pillar for hours.